When Adam Pardy was claimed off waivers from the Edmonton Oilers at the trade deadline, it reflected more than a desire to add a warm body for the remainder of the year. Rather, the Oilers wanted to give the pending free agent an audition with an eye toward adding him to next season’s roster. 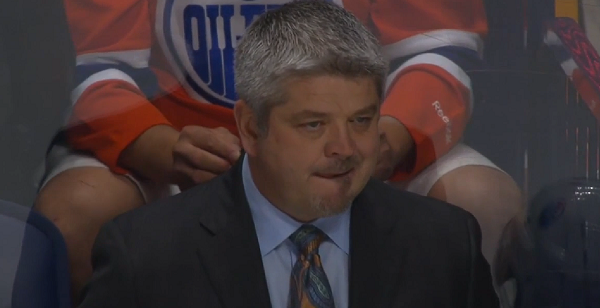 If there had been any doubt of that, Oilers coach Todd McLellan erased it with his comments on Tuesday. Adam wants to play, badly. He’s got a hand injury from blocking a shot, and he’s able to skate so he wants to keep his legs going and his conditioning up as much as he can. The minute he’s good to play we’re going to put him in, because we’d like to find out a little bit more about him. He can’t run the risk of greater injury to himself and hurting the team, and I think he understands both of those situations. He’s very noble, he wants to maintain that conditioning level and we’d welcome him back quickly. 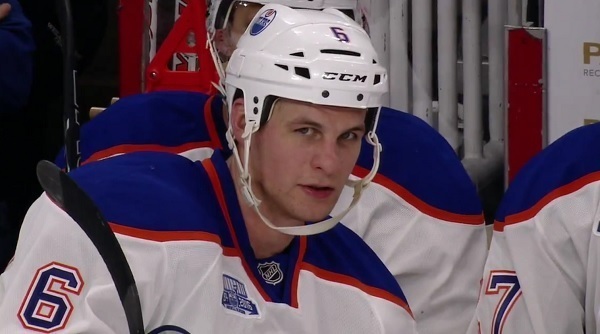 It makes sense that Pardy would want to play. He’s on his third consecutive one-year deal, with annual salaries of $600,000, $700,000 and finally $1.0 million this season. He’ll turn 32 later this month and he’s been healthy for only 20 games on the season; that combination of age and poor health is the kind of thing that can end careers, especially for a depth player in the NHL who was waived by his last team. He’s literally playing for his continued career right now. McLellan’s comment about wanting to find out a little bit more about the player makes sense, too, and echoes what general manager Peter Chiarelli said shortly before Edmonton put in its claim. Pardy’s audition had been going pretty well, but may now be over at six games. If that’s the case and Edmonton has to make a decision on him based on what it knows, does it make sense to sign him? Over the last five seasons, Pardy has been used solely as a third-pair defenceman. He’s averaged between 12:30 and 15:33 per game at even-strength, and evolved from a secondary role on the penalty kill in previous years into a mainstay over his time with Winnipeg. How did he perform? We’ll start with his penalty-killing work, since its only really during his time with Winnipeg that he played enough to get a fair read. Of the seven Jets defencemen to play at least 100 minutes in 4-on-5 situations from 2013-15, nobody had better shots-against metrics than Pardy. He played a little over three hours, and on average the Jets allowed 61 Fenwick events against per hour, down from the team average of 67. It’s reasonable to believe that he’s an asset when his team is down a man. 2011-12 (Dallas): Pardy played with an assortment of partners, and three of the four had better Corsi numbers with him than they did without him (the exception was Mark Fistric, and it doesn’t take much imagination to guess why pairing Pardy with a left-shooting stay-at-home defenceman wasn’t ideal). He played typical third-pair opposition without any zone-start shelter and had decent on-ice numbers. 2012-13 (Buffalo): Pardy played with Mark Pysyk, a young, right-shooting puckmover, and the pairing did rather well. He also played with Mike Weber, a physical, left-shooting stay-at-home defenceman, and the pairing did rather poorly. He got lots of defensive zone starts and played third-pair opposition. 2013-15 (Winnipeg): The same pattern played out in Winnipeg with multiple partners. For the most part, Pardy’s pairings did well (his 52.3 percent Fenwick rating was the second-best on the team over these seasons). He was extremely effective with right-shooting puck-movers; his weakest performances came with left-shooting stay-at-home types. The shot metrics probably exaggerate his effectiveness in that he got a significant amount of offensive zone starts. We haven’t seen a big drop-off yet from Pardy, and in the right situation he looks like a player who can absolutely help in a depth role. He’s useful on the penalty kill, and at 6’4”, 227 pounds he scratches the size itch. More importantly, he’s a guy who can be part of a third pair which wins the territorial battle, and that’s not something which is always the case with this player-type. Given that he’s likely to agree to a one-year deal at low money, Pardy looks like a fantastic fit for the No. 6/7 role next year and his performance over a half-dozen games with the Oilers only confirmed that. The only quibble here is with regard to precise fit on the blue line, as Edmonton may need to clear out some bodies and may prefer a right-shot defender in the No. 7 role given its surplus of left shooters. Is Griffin Reinhart a long-term fit in Edmonton? That’s the fist time I’ve seen someone take a players helmet. I’ve liked Pardy’s physical game – could he be a better (and cheaper) 6/7 D than Gryba? Pardy’s ok for a depth Dman. But how many Depth dmen does a team need? You got him off waivers, I’m sure you can find another Pardy off waivers next year if the need arises. i can see Pardy being signed as a #6 or #7 and sharing those duties with Eric Gryba next season. then just add Demers and Hamonic to Sekera, Nurse, Klefbom and Davidson and bingo….you have….hopefully an improved defense next season! No no no, no more hopefully or maybes! I wanna look at the D roster and say yes, that IS a competent NHL Defense! everyone else playing big min in the minors, then the following year Nurse will play in Gryba’s spot, that’s why I’d only offer Gryba a 1 year deal, which he probably wouldn’t take. After I read this, I googled Cam Barker just to look at his stats. Having said that, maybe his time in the KHL has been good for him. If anything, a try-out like Chicago gave him would be as far as I’d go. Didn’t the Oil have a guy like that…? …damn, what was his name…? I just found it funny that there’s a lengthy article before he became an Oiler why no one should sign him and then the Oilers signed him. But he has played well in the KHL. Maybe he’s played well. Didn’t the oilers already try the Cam Barker experiment? We did – and it failed miserably. He was an important ingredient in completing the Anti-Dynasty, of 3 first-overall picks. First, the KHL isn’t the NHL, not even close. Second, did you see him play last time he was here? OMG brutal! I’m talking Jultz×2 kinda brutal! And third, he’s another left shot which they don’t need. I believe Pardy would be a great #7. He has lots if experience, has the size and can probably get him fir around $750k. I think it is very advantageous to have an older veteran as your #7 instead of a young player who should be playing more minutes on the farm. Consider Pardy a gate keeper for the NHL and a younger player would have to be able to crack the top 6 and not just be a #7 option. Him practicing with the team while injured is also the type of character you want in the dressing room. *Problem not actually solved there are still lots of gaps in the lineup to fill. What do you do with Oesterle?, moving forward that is. Is he an NHL keeper, AHL lifer or part of a trade package? I see issues coming on the Blue line. The Oilers have 5 left handed defensemen, and 1 right handed that will all be trying to get time in the NHL next year, that is without touching a thing. – Oesterle is a depth guy next year I think, and a good one – AHL. – see if there is a trade partner for Fayner, if not you have an expensive 6/7. If there is a trade to be had, and Fayne can be moved, then sign Pardy to a 1 year deal and he can be your #7 and he can play both sides. That leaves the 2 holes in the right to be filled – we need a stay at home solid vet to play with Klefbom (Hamonic/Demers), and they need a young puck mover to play with Sekera (Vatanen). I don’t know what the finances look like but might not be too bad. We can’t break the bank on these right handed d-men and we need to be mindful that after next year Nurse will likely be ready to be a big impact player for us, possibly even Reinhardt. With Klef and Sekera signed long term, and Davidson at that value (love this guy), that is going to make for some interesting decisions. I would sign him to a one or two year deal on the cheap. Having him rotate in as a 6/7 guy wouldn’t really hurt. His size and aggressiveness is a welcome addition. Gryba could handle a bit more based on what he did this year, so why not keep them both? Unless you think Clendinning is the answer? Run Oesterle with one of them to help move the puck, maybe there’s something there. I’d try Pardy/Oesterle in these last few games. I think we all expect that there’s going to be turn-over on the blueline. Depending on who you bring in would decide whether you want another season or two of Pardy. Pardy or Gryba one or the other.Who ever signs the cheapest on a one year deal.For the 6/7 spot. Now please fill the top paring spot this summer.That is the real issue. Like the guy for a couple years at say 900k [ Not my cash ] Adam has done nothing to show me he can be a 6/7 on this team currently. Like his compete – Big , Like Gryba for sure , we tend to forget what Gryba was doing since he has been out with a BOO BOO. I would sign Pardy . Like him for what he brings. Honest effort , tough enough and big. Some gaps in his game but worth another 1 or 2 years tops. EDIT – Can’t be. Not can be. I think we have a bigger problem at the top of the d corps order – than most would think. Ideally – we need a LH QB type d man to handle the top of umbrella formations on the pp, to work same side as our LH centremen – set up on the right side half boards. Sekera is our best and he is not good enough. He is split seconds too slow in mobility, distribution and shooting. At best – a second unit guy. Good guy – but there is a reason why he hits shin pads all the time. Most think – we need a couple of high end right handers. I say we need a high end left hander with QB qualities and an upper end right hander who can shoot the puck. If we could get another right hander in the #4 spot – great, but the other two guys are more important. Depending on how this might be dealt with, would have an impact on Pardy’s situation. Oilers fans and writers can fool themselves all they want. Adam Pardy – 21:18 TOI/game, and 2nd on the Oilers in ice time since he arrived. He’ll be Edmonton’s #7 when Klefbom gets healthy and the Oilers add about 4 more sound defencemen. Add one top pairing guy to knock everyone down one spot and hey Pardy or Gryba is 6/7. I’m actually hoping for 2 top 4 defencman coming via trades this summer. 1) I’m not sure whether Brandon Davidson as your #3 defenceman is the single most ambitious, or single least ambitious thing I’ve ever heard. 2009 offseason? Is that you??? I hardly recognized you! Im glad you gave up on “Omark and a 2nd for Shea Weber”, but I’m not sure “just add a top pairing defenceman” is really any more realistic. The closest Edmonton has been able to come in the last decade was holding Lubomir Visnovsky against his will for a few months before he bolted like a scalded cat at the first opportunity he got. 3) And in yet another example of why you should never do any drugs that have initials: “I’m actually hoping for 2 top 4 defencemen this summer”. You’re thinking Hamonic and Kulikov. I know you’re thinking Hamonic and Kulikov. History says get ready for Ference and Belov. 4) Yes, Chiarelli managed to land Sekera, and I actually give him a lot of credit for that. That was an important add for the Oilers, Chiarelli actually scored the most coveted UFA at his position, something the Oilers have tried to do forever. But he also walked into the draft willing to move multiple 1st and 2nd round picks for an impact defenceman, and all he could walk away with was the 3rd best Reinhart brother. He’s not the worst GM in the world, but neither has he actually accomplished much of anything in Edmonton, and I think it’s a bit optimistic to expect him to turn around unquestionably the worst defence in the NHL in or or two seasons. Quality Dmen don’t just fall from the sky safely in a Lander, and you sure won’t stumble into one walking down the Hall. But we don’t get to make the decisions anyways, so let’s just Gryba some ConYak, Cracknell open a bottle and enjoy the Pardy!! I see sum’ah’yaz wants da keep da Pardy goin. I’m gonna haul out me guitar i tink. Can Austin Mathews quarterback a powerplay by any chance? So we’re building our D on a player who was unable to stick with the Jets. F’ing brilliant! I’m pretty sure you don’t build your D around the 6/7 defenceman. It’s character as much as ability the Oilers are after and Pardy seems to have some. Also, as bad of a season as the Jets are having, their d-core is waaaayyy better than what the Oilers have, so Pardy not cracking it shouldn’t deter PC from bringing him back next year. Wow another 6/7 D. How many 6/7 D (6/7 on a competitive team, not the Oil) does it take to screw in a lightbulb? Clendening (at least his is only 23), Fayne, Gryba, Ference, Nikitin, Pardy – and those are just the active ones. The balance, with the exception of Sekera, are all in their early 20’s and just learning the game. The future of our D looks bright – 5 years from now! TM, how about a R shot 1/2 D before then? I know he hasn’t been here that long, but according to TMac’s comments, he sounds like a real competitor to me and we need more of these guys in the lineup. I would resign him as my 6/7 dman for sure.